Money in the Bank. There’s an awful lot riding on this show, which may seem surprising, considering how underwhelming and largely unimportant this show feels. For everything on the card, there’s only two matches that REALLY matter, and both will break the annual ladder budget. 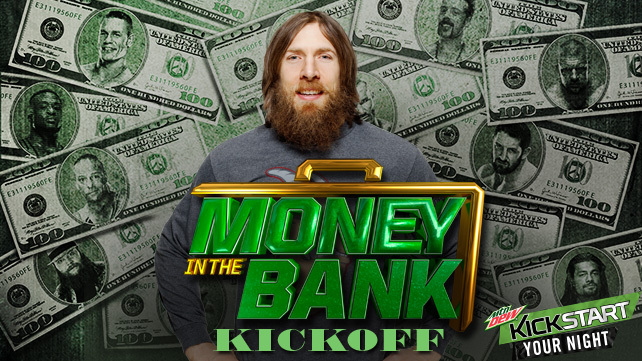 So Daniel Bryan makes his big return on the kickoff show. This is either an indication that WWE is pouring some cool water over a once-hot American Dragon, or that WWE is trying to boost the importance of the pres-show. The latter would be best accomplished by removing Alex Riley from all panel discussions. I’ll be angry if: Bryan comes out, cuts a rushed, pointless promo. Bryan really needs to give his fans an idea of what’s to come next, and what to expect down the road. Roman Reigns, Seth Rollins, Dean Ambrose, Bray Wyatt and Cesaro are competing for that “next breakout star” title. John Cena, Randy Orton and Sheamus aren’t going away any time soon. There’s not a lot of time up top for part-time main eventers named anything but Brock. Bryan either needs to claim his throne as the People’s Champion, or step aside. I don’t expect the latter. I’ll keep my cool if: Bryan gets to cut a 10-minute, emotional promo, re-establishing himself as the ultimate underdog, fighting against the odds to be number one –with or without the WWE World Heavyweight Championship. THEN, I want SOMEONE to come out and challenge Bryan, for a match upon his return. Title or not, you’re the best wrestler in the business, and I want to beat the best, at his best. A little wrestling 101 to get Bryan back in the ring, with a story, before you put him anywhere near the title.